Last night we had a Moroccan couscous and this apple cake. Both recipes are deceptively easy–ones that I make when it is 6pm and I am still not sure what I will make for dinner. For those of you despairing storage apples at your market and waiting for spring asparagus, rhubarb, shelling peas, strawberries and the like to appear, this cake is for you, since I feel a little bad. I know how good I have it here in California. That said, this is no second place recipe. This is a heady-fragrant, springy, crunchy, phenomenal cake that you can make for dessert, morph into lazy morning coffee cake, or have it with tea for an afternoon snack. For those of you familiar with apple cakes, you may balk a bit at the quantity of apples in the cake–four cups. Yes, that is correct. I developed this recipe over the winter holidays when I was asked to make an apple cake with ingredients that I just did not care for. Pretty much the only thing that remained the same was the obscene amount of apples. It transforms the cake into something between a cobbler and a true cake. I could not help myself from sprinkling ample brown sugar over the top for a crackly crunch, but demerara sugar would be fantastic as well. The batter is simple, but relies on quality ingredients. I use half all-purpose unbleached flour and half whole wheat flour. 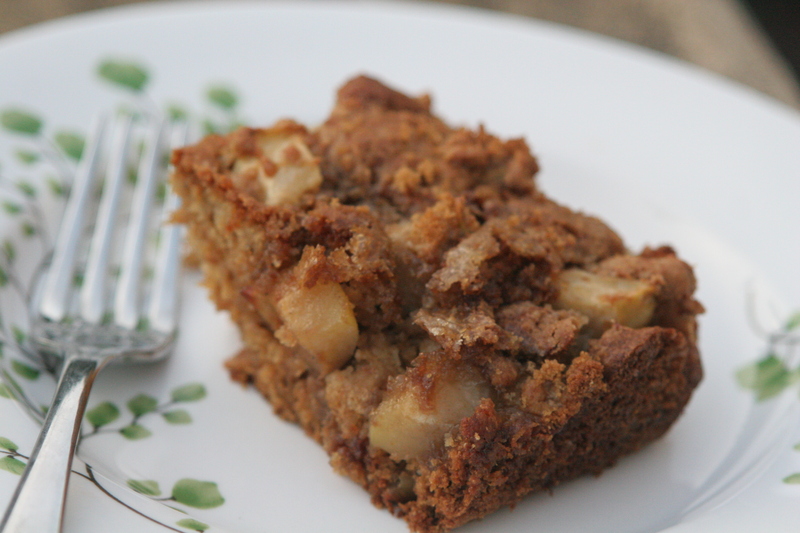 The slightly bitter flavor and coarser texture of plain whole wheat sublimates the humble storage apple into an insanely delicious cake. A nice sea salt like Maldon or a fleur de sel is important too because instead of a homogenous salinity throughout the cake, you have a surprise burst of flavor that heightens the sweet apples and spicy, buttery cake. If you desire, you may peel the apples, but it is not necessary. The skin cooks down nicely and provides textural balance (plus it takes one more step out of the preparation). As for the spices, do not be afraid to bump up the cardamom a little bit. Cinnamon is classic with apples (for a good reason), but it is a really powerful spice. I cut back the amount of cinnamon used in most apple cakes so that both spices have a chance to sing without one overtaking the other. Finally, as always, the nuts are totally optional. I love toasted walnuts with apples so I sprinkle them on half the cake (and no need to toast them ahead of time since the cake cooks for a while). OK, I just had breakfast an hour ago and now I have worked myself into a hunger for another slice of cake. Enjoy! 1. Preheat the oven to 350 F degrees. 2. In a standing mixer or by hand, cream the butter with all of the white sugar and only the 3/4 cup of brown sugar. 3. Add the eggs one at a time scrapping down the sides of the bowl between additions. 5. 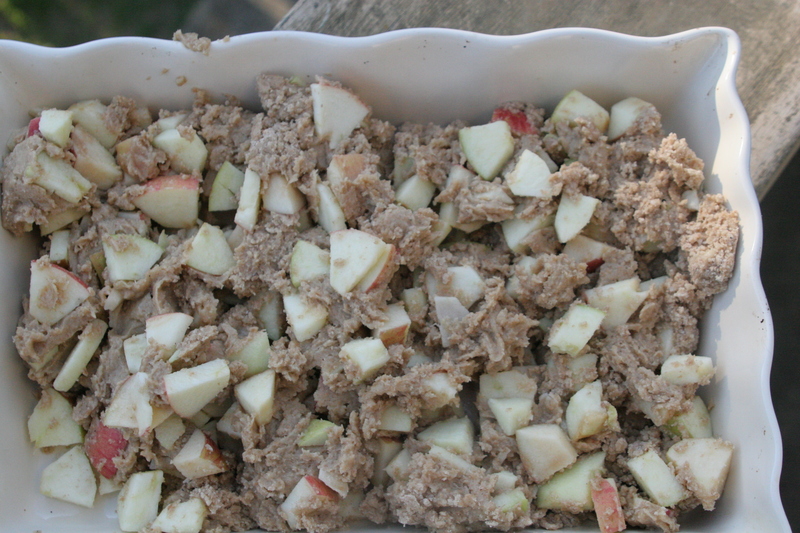 Sift together all the dry ingredients and add until just barely mixed and then fold apples in gently. 7. Sprinkle remaining 1/4-1/2 brown sugar over the top for a crunchy crust and bake for 45-55 minutes or until a toothpick comes out clean. The top will be a nice brown. 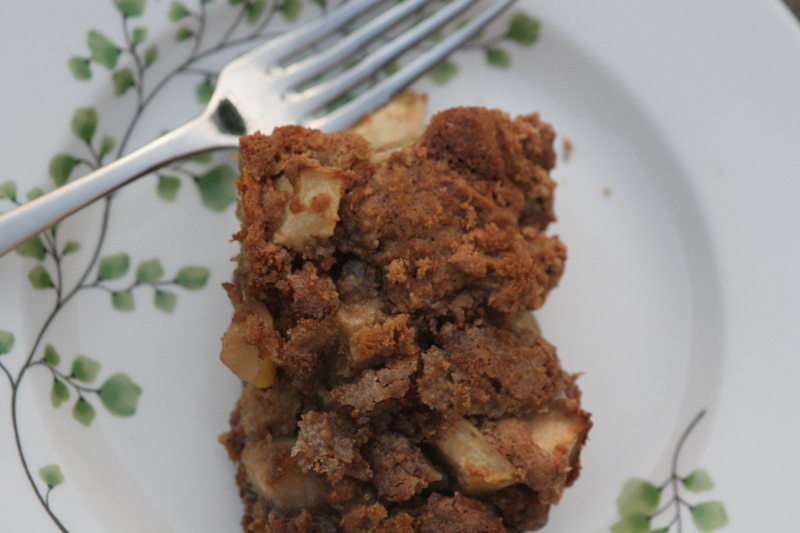 This entry was posted in Cakes, Nuts, Whole Grains and tagged apple cake recipe with whole grain flour, cardamom cinnamon apple cake, whole wheat apple cake, whole wheat cardamom cinnamon apple cake. Bookmark the permalink. I always like your pictures and I find your addition of cardamom to be quite novel!! I will be trying out your recipe in the near future. This cake is SO delicious and super easy too. Thank you thank you! !